“Life Time Achievement Award” by Tamil Nadu Dr. M.G.R Medical University in the year 2012. “Stick to tradition and lets maintain the core values of our Ancestors. •	Medical & Surgical Eye Care. Dr. N. Krishnan... A visionary! He was born to the couple M.N. Narayanan Chettiar and Unnamalai Achi at Kottaiyur, in a family rich in tradition and principles. His schooling at De Britto, Devakottai helped to sharpen values of life & discipline. During his childhood he loved science, won prizes in interschool competitions in science. Many inspired him in the field of healthcare which sow seeds of taking up a career in medicine. 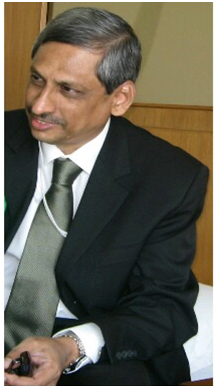 Dr. Krishnan did his under graduation in medicine at Stanley Medical College, Chennai. Months after he passed out of the medical college, though his aspirations were different, his affinity towards his mother made him change his mind and choose Ophthalmology as his profession. His senior residency at Joseph Eye Hospital in Trichy and peripheral hospitals in Thuraiyur was a trend setter to become an eminent Ophthalmologist. He did his Masters in Ophthalmology at J J M Medical College, Davangare, Karnataka. He was curious in continuous learning and mastered surgical skills very soon while others were just started practising. A meeting with Dr. SS. Badrinath, his mentor made Krishnan eschew a rare opportunity to get trained further & work abroad and join Sankara Nethralaya. Krishnan did his fellowship in Glaucoma and became a consultant in Glaucoma service. He had many national & international paper presentations and scientific publications to his credit which added more feathers to his cap. Icing the cake was the original research paper on the effect of Mitomycin - C and Five flurouracil (Anti cancer medications) on recalcitrant glaucoma considered meritorious at different platforms in various countries. Well experienced Dr. Krishnan keen on serving the underprivileged, started Frontline Eye Hospital at Alwarpet, and simultaneously two satellite centres at Ambattur & Karaikudi in 1994 beginning his mission to save the vision of millions of people. Krishnan’s contributions in Ophthalmology have saved several lives through his monthly free eye camps, free medical & surgical camps in rural and tribal areas, vision screening which covered more than a lakh of school children, eye camps for special children. His paper in 12th International conference on Low Vision held at Netherlands in June 2017 was well received and paved way for a training on “Cortical Visual Impairment” for a team of Eye Care professionals from Indonesia at Frontline Eye Hospital, Chennai in Oct 2017. His one word to success is “Commitment”. But Krishnan did not stop there. The most recent, Kaanal, a new charitable trust is a continuation of his thought process conceived a way back in 1994. Dr. Krishnan the founder trustee of Kaanal formed a team of noble hearted eminent trustees, to give vision to the needy in the Karaikudi - Sivaganga region with the support extended from Koviloor Mutt. Koviloor Eye Hospital which is of international standard will be a hallmark in eye care, research, training and rehabilitation in this part of India attracting everyone around. Krishnan’s ancestral bungalow in Kottaiyur is now a new home for several Ophthalmologists and vision care professionals. He has no words to thank his parents who were his breath, his siblings who are nothing but his own soul, his wife and children are his strength and support. Last but not least he is immensely thankful to his frontline staff and friends of frontline.